An evil caliph (Christopher Lee) offers his daughter’s hand in marriage to a prince if he can complete a perilous quest for a magical rose. Helped by a young boy and a magic carpet, Prince Hasan (Oliver Tobias), has to overcome genies, fire breathing monsters and treacherous swamps to reach his prize and claim the hand of the Princess Zuleira (Emma Samms). 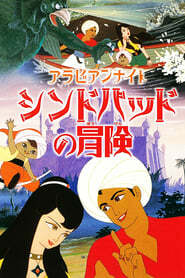 From Anime-Planet Two young aspiring adventurers, Sindbad and Ali, find an old sailor who has washed up on the shore. With his final breath, the sailor tells them a tale of a hidden treasure and hands over the map he had held on to through his trials. And so, the two would-be heroes are off for adventure. But the road to riches is paved with hardships their travels lead from stowing away on a ship to the sultan's dungeons -- only to escape with the sultan's daughter in tow!